For a definition of what a Product is in the SubscriptionBridge system, please see the Glossary. The following main properties are available on the Add New Product page. This field is required. The Reference Name is the product's name within the SubscriptionBridge Merchant Center. It is not shown to customers. It helps you quickly identify the Product in the Merchant Center, so it does not need to be customer friendly, but rather useful to you and your staff (e.g. it could be an internal product code that you and your staff are familiar with). This setting only applies if you are using the Simple Integration. If you are using a shopping cart integration, this feature has likely been built into the shopping cart integration and available to you as part of the shopping cart administration features. You can specify whether customers should be asked to acknowledge and accept a “Terms & Condition” document when activating a subscription for a Package that includes this Product. Since the Terms & Conditions change depending on the front-end language chosen by the customer (assuming you have enabled multiple languages in your store), the Terms & Conditions document is not entered on this page, but rather on the Names & Descriptions page (see below), which supports multi-lingual entries. This setting only applies if you are using the Simple Integration. The settings allows you to indicate to the SubscriptionBridge shopping cart whether a shipping charge should be added to the subscription. This setting only applies if you are using the Simple Integration. The settings allows you to indicate to the SubscriptionBridge shopping cart what the shipping charge should be. If you need a more complex kind of shipping calculation (e.g. dynamically retrieving shipping rates from UPS or FedEx), we recommend that you use an e-commerce system that supports SubscriptionBridge and that matches your needs. You can find a list under Shopping Cart Integration. This setting only applies if you are using the Simple Integration. The settings allows you to indicate to the SubscriptionBridge shopping cart whether the product/service is taxable. Taxes will be calculated as described under Tax Settings. If you need a more complex kind of tax calculation, we recommend that you use an e-commerce system that supports SubscriptionBridge and that matches your needs. You can find a list under Shopping Cart Integration. This field defines whether the Product is active or not. SubscriptionBridge supports a multi-lingual front-end (the Merchant Center, instead, is only available in English at this time). Therefore, you can add Names, Descriptions, and Terms & Conditions for your Products in each of the languages that you have activated for your store. Enter a name for this Product in the Language you have selected. This entry is shown to customers in the SubscriptionBridge front-end (e.g. in the SubscriptionBridge Shopping Cart, Customer Center and in e-mail Notifications). Enter a description for this Product in the language you have selected. This entry is shown to customers in the SubscriptionBridge Shopping Cart only. Descriptions are not used in e-mail notifications. Enter Terms & Conditions that customers need to agree to when subscribing to this product or service (if applicable). Terms are shown in the SubscriptionBridge Shopping Cart and linked-to from some e-mail notifications. Once you have added names, descriptions, and terms in multiple languages, the Names/Descriptions page will present them using a tabbed layout where each tab corresponds to a different language. To edit any of the entries, click on the tab that represents the language that you need to edit, and click on the Edit icon ( ). Under Packages, mouse over Products. The system will display a preview of the products you added to that store. Click on the link to load the list of Products. Click on Names & Descriptions to view and edit the product name and descriptions used in the SubscriptionBridge front-end pages (SubscriptionBridge Shopping Cart and Customer Center) and in e-mail notifications sent by the system. 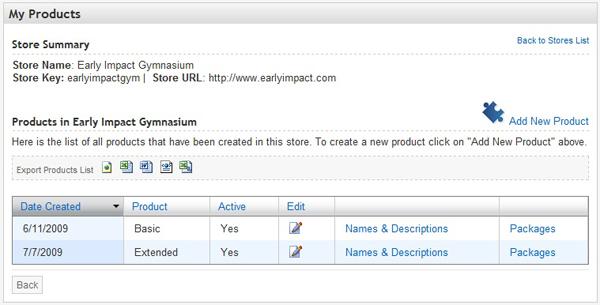 Click on Packages to view and edit existing Packages for the selected Product. In the Packages section, mouse over Products. The system will display a preview of the Products you added to that store. Click on the link to load the list of Products. Products can only be deleted when not used in a Package. When a Product is used in a Package, the checkbox is not shown. When no Products can be deleted, the Delete Selected Records button is not shown on the page. A plan defines the billing arrangement (see the Glossary). Plans are not product-specific. The same Plan (e.g. monthly payment, with a free 2-month trial) could well be shared across different subscription-based products and services. Different payment gateways have different requirements and limitations with regard to the billing plans that they can support. For example, Authorize.Net does not support a billing period that is shorter than 7 days. SubscriptionBridge is setup to enforce these requirements/limitations when you create a new plan, depending on which payment gateway you have selected. So if Authorize.Net is the payment gateway selected for a certain store, and the billing period is “days”, then the number of days that can be selected will start at 7. Authorize.Net also requires that the standard billing and trial billing periods share the same billing unit (days vs. months) and frequency. Therefore - if Authorize.Net is the selected payment gateway - only the total number of trial occurrences can be set. The page will display a list of available Plans. Click on Add New Plan to add a new one. This is an internal name for the Plan. It is not shown to customers. Select the billing interval from the following selections: day, week, month, year. You can use the Billing Frequency field to “adjust” the Billing Period. 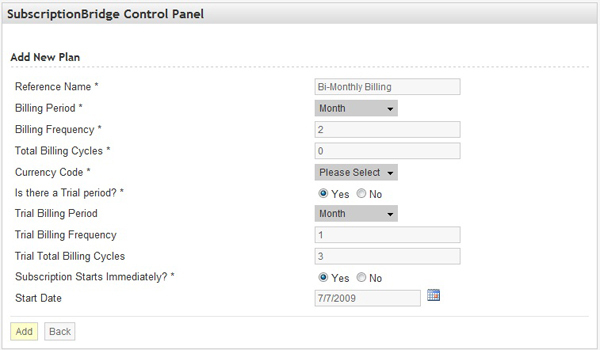 For example, to create a Quarterly Billing Period, choose Month here and then enter 3 under Billing Frequency. Select how often the subscription will be billed, based on the interval selected under Billing Period. For example, if you are selling a bi-weekly subscription, you will select “Week” under the Billing Period and enter 2 under “Billing Frequency” (the subscription will be charged every 2 weeks). Note that some payment gateways have restrictions on the frequency. For example, Authorize.Net requires that the billing interval be between 7 and 365 day (i.e. you can't have a subscription shorter than a weekly subscription, if you are using Authorize.Net). 8 under Total Billing Cycles (4 quarters a year, times 2 years). Select the currency used by your store. Indicate whether there is a Trial period or not. Note that a Trial does not have to be a “Free Trial”. In fact, the trial amount could be higher than the regular subscription amount (e.g. it may include an initial setup fee). You will specify the trial amount at the Package level. Select the billing interval (e.g. “Month”) for the Trial period. NOTE: with Authorize.Net, this is not supported: by default the Trial Billing Period is the same as the Billing Period. Select how often the subscription will be billed during the trial, based on the interval selected under Trial Billing Period. For example, if you want to offer a 3-month trial at a discounted price, you will select “Month” under the Trial Billing Period, enter 1 under “Trial Billing Frequency”, and enter 3 under Trial Total Billing Cycles. NOTE: with Authorize.Net, this is not supported: by default the Trial Billing Frequency is the same as the Billing Frequency. Enter the total number of billing cycles for the Trial Period. For a free 1-month trial, you would enter 1 here, 1 under Trial Billing Frequency, and “Month” under Trial Billing Period. NOTE: with Authorize.Net the Trial Billing Cycles (“Trial Occurrences” in the Authorize.Net documentation) are counted as part of the Total Billing Cycles (“Total Occurrences” in the Authorize.Net documentation). In most cases, you will answer “Yes” as the subscription will start at the time it is ordered. If there is a Trial Period, the subscription will start with the trial. Otherwise, if the subscription is set to start in the future (e.g. the first of January of the following year) select a Start Date in the corresponding field. Enter a Start Date if the subscription is not set to start immediately (i.e. at the time it is ordered). If there is a Trial Period, the Trial will start on the Start Date. Under any of the stores, locate the Packages section and mouse over Plans. The system will display a preview of the plans you added. Click on the link to load the list of Plans. If you edit a Plan's properties (e.g. you decide to edit the billing cycle), this will affect new subscriptions that are created in the SubscriptionBridge system for any of the Packages that use that Plan, but it will not affect existing subscriptions. In the Packages section, mouse over Plans. The system will display a preview of the Plans that you added to that store. Click on the link to load the list of Plans. Plans can only be deleted when not used in a Package. When a Plan is used in a Package, the checkbox is not shown. When no Plans can be deleted, the Delete Selected Records button is not shown on the page.